Updated | TV and radio reception across the British Isles has been affected by atmospheric conditions, which first started over the weekend. 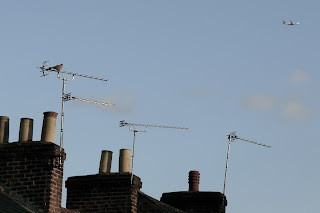 Conditions in the troposphere associated with areas of high pressure affect how far TV and radio signals travel and currently have the potential to affect viewers until later in the week, especially, but not exclusively in coastal areas and across northern and western parts of England and Wales. Terrestrial TV services - Freeview in the UK and Saorview in the Republic of Ireland - and other services that piggyback on them for the reception of some channels, such as YouView (BT TV, Plusnet TV, TalkTalk TV) as well as terrestrial radio services (e.g. FM and DAB) are affected by tropospheric conditions. Satellite, cable and fixed line internet services are unaffected. While the conditions allow radio enthusiasts to receive distant stations, it can block or interfere with reception of locally transmitted stations or the links between transmitters. On TV, this may manifest itself in the form of blocking, picture break-ups or temporary loss of signal. As a result, some services may be lost or suffer interference for varying periods of time, but reception should return to normal when atmospheric conditions normalise. Therefore, viewers are advised not to retune in this instance, as it may cause the loss of their existing channel list, the addition of incorrect regional versions of stations or loss of channels from the Electronic Programme Guide, which would then force the viewer to have to retune again. There is little to be done about the conditions affecting reception until the weather changes, although households frequently experiencing loss of Freeview channels should have their aerial set-up checked out. The Radio and TV Investigation Service provides viewers with advice on what to do if they encounter reception problems, and if any work is taking place at local transmitters, which may also impact reception. Freeview also offers further advice on receiving its terrestrial TV service in the UK.